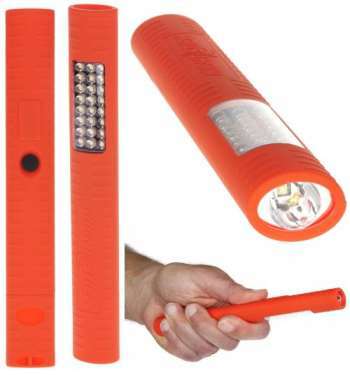 Nightstick Multi-Purpose - Dual-Light w/ Integrated Magnet - LED - 4AAAThese non-rechargeable multi-purpose Dual-Lights use a single body switch offering the user a choice of flashlight, floodlight or dual-light operation. The compact oval design makes them convenient to use and carry. Their water resistant housings are made from engineered polymer and have a soft touch finish. The light has an integrated body magnet for hands-free use. Power comes from 4 included AAA batteries.